Unfortunately sometimes the things that are designed to keep children safer can pose a real safety risk. Since 2002, seven children have been strangled to death and three children have been nearly strangled to death by video and audio baby monitor cords, according to the Consumer Product Safety Commission. By putting the baby monitor within reach of the baby, the monitor cord can be pulled into the crib and end up wrapped around the baby’s neck, resulting in injury or death by strangulation. The Consumer Product Safety Commission is recommending that parents and caregivers place audio and video baby monitors at least 3 feet away from a baby’s crib, play yard or sleep space so that the cords are not accessible to the children. The Juvenile Products Manufacturers Association (JPMA) has launched a campaign to educate parents and caregivers about the risks involved with baby monitor cords and placing audio and video baby monitors too close to the baby’s crib. 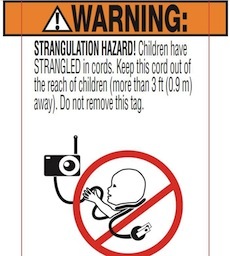 JPMA is also giving out free labels for parents to attach to the cords of all baby audio and video monitors to remind anyone who is caring for the baby to place the monitor well out of reach of children. But baby monitor cords aren’t the only hidden hazard in a baby’s sleep space. Crib bumpers have been used for years to create a soft barrier between a baby and the hard, wooden crib rails and to add a decorative touch to a baby’s crib. In 2011, after the American Academy of Pediatrics issued the recommendation that crib bumpers should never be used, Chicago became the first state to ban the sale of crib bumpers. Between 1985 and 2005, the Consumer Product Safety Commission reported that there were 27 accidental deaths of children 1 month to 2 years of age attributed to strangulation by a bumper tie around the neck or suffocation when they became wedged against a bumper pad. Removing crib bumpers can remove this safety risk. In addition to crib bumpers, other soft items like loose blankets and bedding can also pose a real safety risk. Re-breathing exhaled air that is trapped around a baby’s face by loose blankets and bedding can result in death. Breathing carbon dioxide (re-breathing) has been linked to Sudden Infant Death Syndrome (SIDS). As an alternative to blankets, parents and caregivers can use wearable blankets that keep babies comfortable without posing a safety risk. Toys and pillows should also not be placed in a crib or baby’s sleep space due to the risk of choking or suffocation. Overheating is another hidden safety risk. In efforts of creating a warm sleep environment, parents often overdress their babies and turn the heat too high. A safe sleep temperature should be between 67 and 70 degrees Fahrenheit and should be comfortable to a lightly clothed adult. If a baby is sweating or feels warm to the touch, a layer of clothing should be removed to avoid overheating. Another devise that has been marketed for safety that can cause more harm than good is infant sleep positioners. Infant sleep positioners have been marketed as a safety device to parents who wish to keep their babies from rolling over during sleep, yet these positioners can pose a suffocation risk. Since babies spend most of their unsupervised time in their crib or sleep space, it’s vital that parents and caregivers be proactive and minimize all potential sleep safety risks.